Anyway, I attended the Manga Entertainment sponsored Anime All-Nighter at this year’s Sci-Fi London Festival on Saturday night/Sunday morning. It was the usual fun and games: generally good spirit, still no WiFi or air conditioning in the screen, free ice cream/tea/coffee/terrible energy drinks. And an eclectic mix of movies. Just mentioned this in my Spring 2009 anime post, but I love it so much it deserves it’s own post. After a surprisingly short ‘break’ from the industry, Yui’s back. The song is the first OP theme for Full Metal Alchemist: Brotherhood and is gorgeous! It’s the lyrics that speak to me most (included after the jump). In keeping with my Yui-fest this month I finally got around to watching her feature film debut, Taiyo no Uta, which I picked up on DVD in Malaysia over the summer. 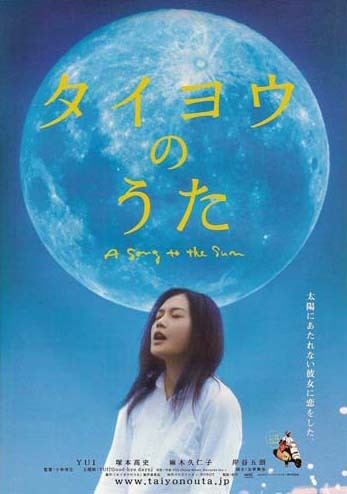 The story is about Kaoru, a teenage girl with the rare xeroderma pigmentosum (XP) disease. Since UV light would kill her (or at least accelerate her nervous system’s breakdown) she sleeps in the day and lives at night, writing songs and playing her guitar. In between sunset and sundown she watches a young boy she’s interested in from her hill-top home, wishing she could one day meet him. Of course, she gets the chance and that’s when things change, for better and for worse. And yes she does sing live and record a CD and all the other cliches you would expect from this sort of movie, especially a Japanese one. But cliched as it is, it is really sweet and done in good form. There were few moments I found really cringe-worthily melodramatic, which is more than can be said for some Japanese movies I’ve seen, and overall I thought the story was portrayed really sensitively and well. It helps that it’s all reasonably slow moving and good natured with decent, if not really outstanding, performances from the cast. What you really want to know is if Yui can act. IMHO, despite the potentially melodramatic plot, she doesn’t really have to stretch any acting muscles that hard in this and is her usual semi-reserved self (some would call it bland. Not me — I love Yui!). It’s sweet for the right moments and of course she really comes into her own in the singing parts. Look out for the Yokohama street live with Skyline, and you’re guaranteed to have Goodbye Days (the signature track) playing on repeat for days after seeing this. If I’m honest, it’s not as strong an album overall as Can’t Buy My Love. But like I Loved Yesterday, I feel it’s got some really outstanding tracks that make up for the so-so ones. ‘HELP’ is absolutely outstanding, even if it is quite old now (this is a B-sides collection after all) and I’d forgotten how much I love ‘Oh My God’ and ‘Winter Hot Music’. 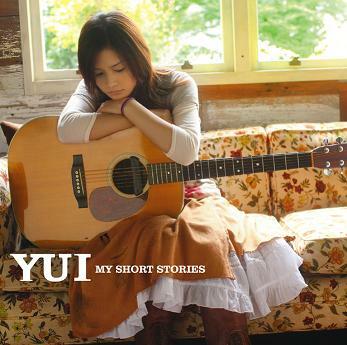 ‘Why Me’, apparently the first song Yui wrote, is also very pretty. Also, if it doesn’t sound too strange, I really like the paper the CD booklet is printed on. Nice and glossy. I believe my god　oh oh oh! I believe myself oh oh oh!